Do you know what BakeSpace is? Shortly, it's a beautiful social network for people who like food, cooking, baking, and sharing their ideas, recipes and more. And it's true what they say, "Come for the food, stay for the conversation." It's a really fun and friendly community that gathers a huge number of foodies. Check it out, you'll love it. Well, I joined Bakespace early this year, and a couple of months later joined the forums as well. There's a lot going on there, every day. From simple chat in Breakfast club and Happy Hour, daily dinner suggestions, to wine club, and, one of my favourites, THE BAKESPCE TEST KITCHEN. What's going on in Bakespace test kitchen? There is a topic each month, and everyone is invited to try or invent something new. Sometimes it's an ingredients challenge (one or more ingredients you have to use in a recipe) or a specific theme. This month's theme is TURKEY, and I'll be doing it later this month, I already have something in mind. But since I'm always behind with posting, and I absolutely didn't want to miss on the last month's challenge, I'm posting it first. Those who read my blog regularly, will remember my complaining last month about too much work and too little free time. However, last month was my husband's birthday and the theme of BakeSpace monthly challenge was perfect to join the two, and... well, with little time at my disposal, ingredients I forgot to buy... I still managed to make this. The theme of the challenge was Strawberries and eggs. So here's my STRAWBERRY AND WINE CAKE. The cake is a simple sponge cake, baked in a large baking tin. Separate the whites from the yolks. Whip the egg whites with a pinch of salt and set aside. Beat the yolks with sugar and water until light and thick. Carefully fold in flour, cornstarch and egg whites. Cover two shallow baking tins (36x30 cm) with parchment paper, greased and floured. Pour half of the batter in each tin, spread evenly with a spatula, and bake in an oven preheated to 180°C for 5-7 minutes. Don't let it dry too much. Remove it from the tin, but leave on the parchment paper, just pass the knife underneath to detach it from the paper. 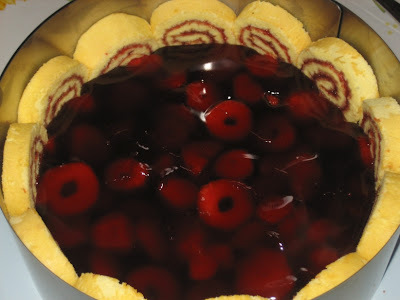 Spread some strawberry jam in a very thin layer (I don't know how much, 4-5 tablespoons), and roll immediately. Wrap in the parchment paper you used for baking and leave to cool completely. When both rolls are completely cold, cut them into 1cm thick slices. Place the ring of your spring form on a plate on which you'll be serving the cake. 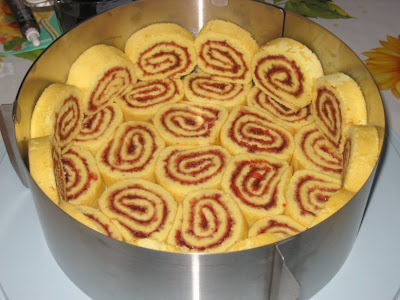 Line the bottom and sides with roll slices. Wash, haul, dry and slice the strawberries. Place them in the ring over the cake. Prepare the gelatine. Mix sugar with the powdered gelatine. Add the wine and fruit juice, stir and bring to boil. Keep stirring until it thickens and becomes transparent. Pour over the strawberries. If I make it again, I'll mix the strawberries with gelatine first, and then pour everything in, so that the strawberries are covered better. 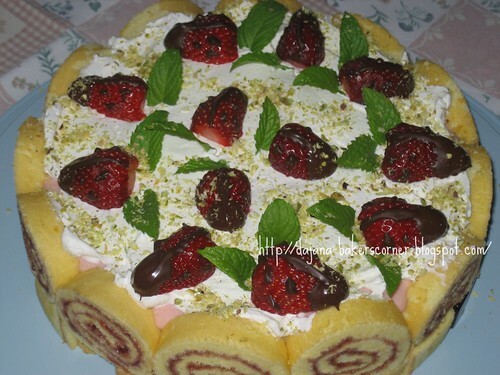 Cream: Leave the gelatine leaves in cold water for 10 minutes. 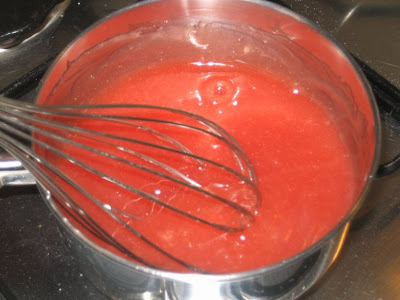 Mix fruit juice with sugar and lemon juice and bring to boil. 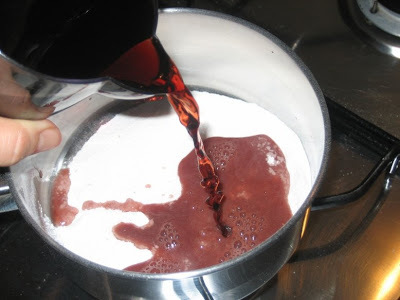 Mix the cornstarch with little cold water and pour into the boiling juice, cook until it thickens. Remove from heat and add the softened and drained gelatine. Stir well until gelatine has melted. 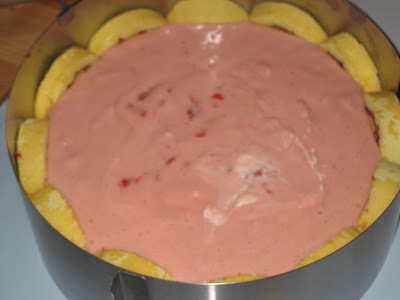 When it has cooled completely, add the whipped cream and pour over the strawberries. Leave it in the fridge for at least 3 hours (or overnight). 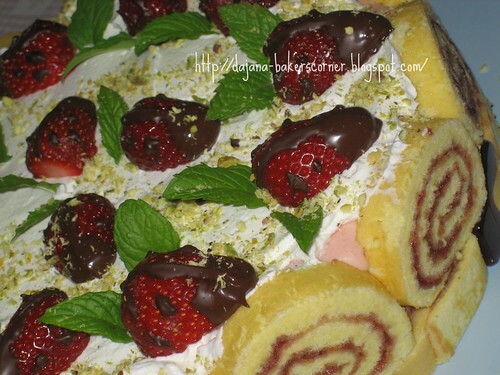 Remove the ring and decorate with whipped cream and strawberries, sprinkle with chopped pistachios, add a few leaves of fresh mint. There you go! How do you like it? Challenging, right? But also deliciously full of flavours and simple at the same time. Za biskvit umutite bjeljanjke s malo soli. Mutite dugo žumanjke s 3 žlice vode i šećerom. Dodajte naizmjenično obje vrste brašna i bjeljanjke miješajući lagano drvenom kuhačom. Stavite po komad papira za pečenje u dvije široke tepsije (36x30 cm), namastite ga i pobrašnite, pa ulijte u svaku po polovicu tijesta. Pecite u pećnici zagrijanoj na 180°C 5-7 minuta. Izvadite i odmah premažite pekmezom pa savijte u rolat, omotajte papirom na kojem su se pekli i ostavite da se ohlade. Narežite rolate na kriške široke oko 1 cm. Stavite metalni obruč od kalupa za tortu na pladanj na kojem namjeravate poslužiti tortu i obložite dno i stranice kriškama rolata. Jagode operite, odrežite peteljke, osušite ih i narežite na tanke ploškice. Složite ih unutar obruča. Pripremite preljev. Pomiješajte šećer i sadržaj 2 preljeva za torte, pomiješajte s vinom i sokom pa kuhajte dok se ne zgusne i postane proziran. Ulijte preko jagoda. Još bi bolje bilo da sam prvo pomiješala jagode s preljevom, a onda sve ulila u kalup. Ostavite da se ohladi. Za kremu, pripremite puding od voćnog soka. Pomiješajte sok sa šećerom i limunovim sokom. Prokuhajte, pa dodajte škrobno brašno koje ste otopili u malo hladne vode. Miješajući kuhajte da se zgusne. Sklonite s vatre i umiješajte listiće želatine, koje ste prethodno namočili u hladnoj vodi 10 minuta. Promiješajte da se želatina otopi i ostavite da se potpuno ohladi. U hladan puding umiješajte tučeno slatko vrhnje pa ulijte u kalup prego jagoda i želatine. Ostavite u hladnjaku najmanje 3 sata da se stvrdnjava (još bolje preko noći). Prije posluživanja, uklonite obruč, ukrasite tučenim slatkim vrhnjem, svježim jagodama, listićima mente i narezanim pistacijama. 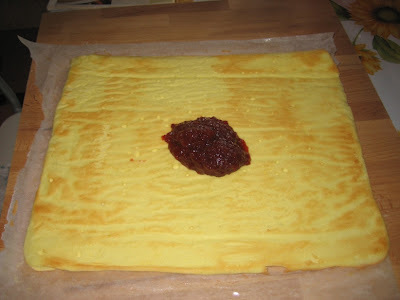 Pan di spagna: 6 uova, 150 g zucchero, 80 g farina "00", 70 g amido di mais, marmellata di fragole. Per il pan di spagna preparare due teglie rettangolari grandi (36x30 cm), mettere un foglio di carta da forno, imburrare e infarinare. Riscaldare il forno a 180°C. Separare le uova, e montare a neve i bianchi con un pizzico di sale. Con la frusta elettrica sbattere a lungo i tuorli con lo zucchero e 3 cucchiai di acqua. Aggiungere delicatamente la farina, amido e i bianchi montati, mescolando con un cucchiaio di legno per non smontare il tutto. Dividere il composto tra le due teglie, livellare la superficie con un cucchiaio e infornare per 5-7 minuti. Togliere dal forno, spalmare subito la superficie con della marmellata e arrotolare. Avvolgere nella carta da forno e lasciare raffreddare. Appoggiare un cerchio di acciaio sul piatto. 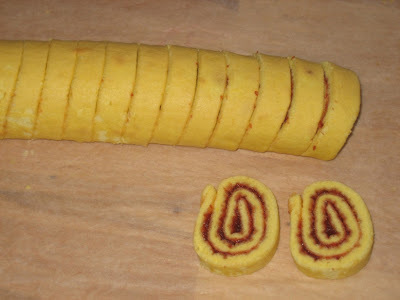 Tagliare il rotolo a fettine larghe 1cm. Sistemare le fettine sul fondo e lungo il bordo del cerchio. Lavare le fragole, togliere il picciolo, e tagliarle a fettine. 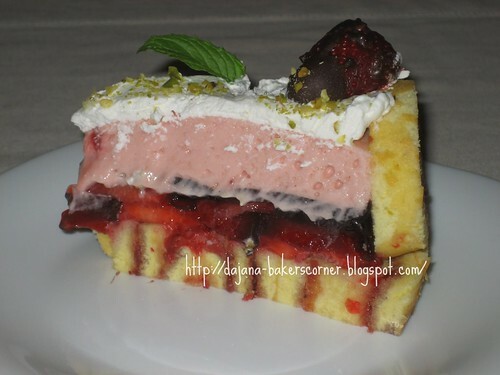 Sistemare le fragole sul fondo della torta. Preparare la gelatina. Mescolare lo zucchero con il contenuto delle bustine di Tortagel. Aggiungere il vino e il succo. Portare a ebollizione e cuocere a fiamma bassa finché non si addensa e diventa trasparente. Versare sopra le fragole, e lasciare raffreddare. Per la crema preparare il budino con il succo di frutta. Mescolare il succo con lo zucchero e succo di limone. Quando comincia a bollire, aggiungere l'amido di mais che avete sciolto in un po' di acqua fredda. Cuocere per qualche minuto mescolando finché non diventa denso. Togliere dal fuoco e aggiungete i fogli di gelatina che avete lasciato in ammollo per 10 minuti in acqua fredda e poi strizzato bene. Mescolate bene per sciogliere la gelatina e lasciate raffreddare completamente. Montate a neve ferma la panna e aggiungetela al budino freddo. Versate la crema sopra le fragole e mettete in frigo per almeno 3 ore (ancora meglio tutta la notte). Prima di servire, togliete il cerchio, decorate con la panna montata, fragole, foglioline di menta e pistacchi tritati. Questa è la torta che ho preparato il mese scorso per il compleanno di mio marito. 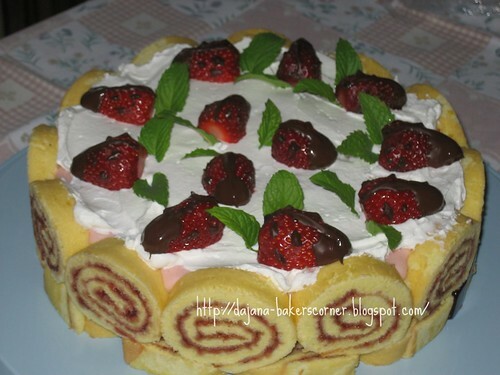 Oh my god - Dajana that is a beautiful cake!! I'm impressed! Um...that is absolutely out of this world amazing!! Wow! That's a really beautiful cake....I am truly impressed. Oh my gosh! That is so pretty! I love the wine and the strawberries, in fact, I love all of it! Nice Job! OMG! This looks amazing. Great you post this just when I am trying to watch the figure LOL Great Job! I'm awestruck!!! What a great idea!! I can only imagine how scrumptious this is!!! I have these creative fits every now and then, if I had more people to eat my desserts, beside myself, it would probably happen more often. 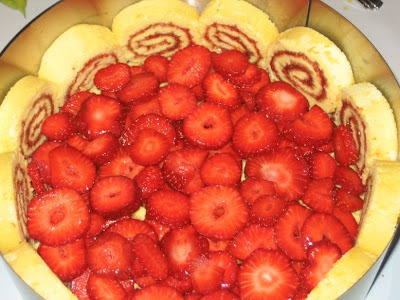 I just HAVE to make this cake for my hubby, he LOVES strawberries. It's so beautiful too. You're awesome girl! Thanks for blogging it! It's a pleasure DD, glad you like it. I'm imagining your homemade strawberry jam in it (or the one with balsamic! yummy! I love how pretty it is, how you rolled it all up before putting it in the pan! Oh my gosh, how did I miss this on BakeSpace?? I guess I missed a lot while I was on vacation. This looks and sounds absolutely amazing. Too bad I can't drop by and have a taste, ha ha. You are a great addition to BakeSpace by the way, so glad that you joined. Hej Dajana..planiram raditi ovu tortu u nedjelju, isto muzu za rodjendan ;) Nego, jedino ne znam sto je skrobno brasno? Naime, u Austriji sam i pojma nemam sto bi to bilo? :) Help! Ana, drago mi je da si se odlučila raditi ovu tortu. Škrobno brašno je gustin, ne sjećam se dobro na njemačkom. Tako je, imas pravo, pronasla sam i ja. Javim ti rezultat, radim je u nedjelju, a jedemo je u ponedjeljak..Drzi mi fige :) Zelim tebi i tvojoj obitelji ugodne blagdane! Hvala, Ana na izvjescu, drzim fige da sutra bude fina i da uzivate u njoj, a tvom muzu sretan rodendan. Hvala tebi, draga Ana, sretna sam da ti je uspjela i radujem se daljnjem druženju. Ovo ti je prekrasno, savršeno si je napravila. Bilježim ovo za probu.